What is 4 Rent Apartments? We are an agency dedicated to the rental of furnished fully equipped apartments. Not only do we help you find the perfect apartment, but we also assist you in anything you might need during your stay. 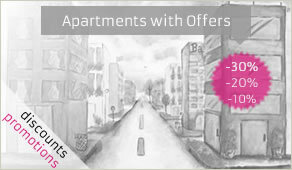 Most of our apartments do not require a minimun stay, Day/Week/Month/Year, you are welcome. You have to get into the Booking section under the apartment you chose and fill out the form. You can also access the Booking section directly from the homepage and fill out the form, chosing the apartment you like. How much do I have to pay to make the reservation? You have to pay 20% of the total amount of your stay. Once you check in and sign the location contract. Do the prices includes taxes? Usually, the published rates include all the expenses of the apartment: electricity, gas, building fees, taxes, water and –when specified- cable TV and maid service once a week. In all the cases, the expenses included are published in the sheet of each apartment. Please, verify the expenses included in the published rate of the selected apartment. Am I required to pay a security deposit for the apartment? a) If the stay is the same or less than 2 weeks: The equivalent for 1 week of rent. b) If the stay is between 2 weeks and a month: The equivalent for 2 weeks of rent. c) If the stay is a month: The equivalent for 2 weeks of rent. d) If the stay is longer than a month: The equivalent for a month of rent. 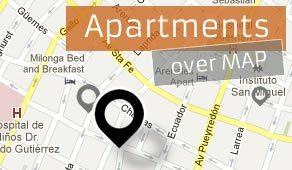 On day and time stated with you via e-mail, a representative of For Rent Argentina will receive you at the apartment to give you the keys and sign the contract. It is normal to have also the landlord receiving you that day to introduce himself. Who will come to say goodbye on my departure day? On day and time stated, the landlord of the apartment will come to your place to say goodbye, receive back the keys and give you back the deposit. All of our apartments count with towels and sheets. You would have to pay for what you broke. You can call us to our office or to a 24/7 available cellphone and we will assist you. Do the apartments have telephone? a) Pre-paid line: a telephone line that works with credits that you should add to the telephone line. In those cases you will be able to purchase the pre-paid calling cards in order to add credits into your telephone line. Those pre-paid calling cards are sold at the “Locutorios”. b) Control line: a telephone line that works with some monthly credits already included in your rent. In those cases, you will probably have some credits to make local phone calls upon arrival. Once those credits are gone, you will need to purchase a calling card at a “Locutorio” and add those extra credits into your telephone line. Do I have to pay any administrative fees? We do not charge any commission, you just have to pay USD 45.- of administrative fees.